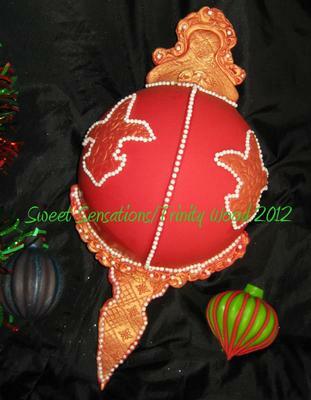 This vintage ornament cake was made with the Wilton ball cake pan and then frosted in butter cream icing. It was then covered with fondant. Next, I sculpted modeling chocolate by hand to create the extended decorative pieces as shown in the picture above. I used an impression pin to create the texture and then painted over them gold with my airbrush tool. I did the gold color over red so that it would look like the older style vintage glass ornaments. I then used a fleur de lis cutter to make the design on the front of the ball as shown in the picture. The pearls were all hand applied one by one with a pair of tweezers and affixed with gum glue. Everything on this cake is completely edible. The smaller ornaments are made with modeling chocolate and fondant. I truly loved making this cake! It was a lot of fun.